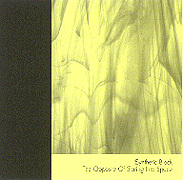 The Opposite of Staring Into Space continues in the style set down on the debut self titled CD by Synthetic Block. With references to the past like the brittle sound of mellotron flute and percolating analogue sequencer cycles completely in sync with modern electronic percussion and harmonically complex samples, The Opposite of Staring Into Space rises above its technical attributes. Layers of rhythms and chord shifting patterns that slowly arise out of a spacey intro comprise the typical track. With little in the way of tension and release, the CD still engages the listener - much in the same way visiting a favorite destination engages the traveller.